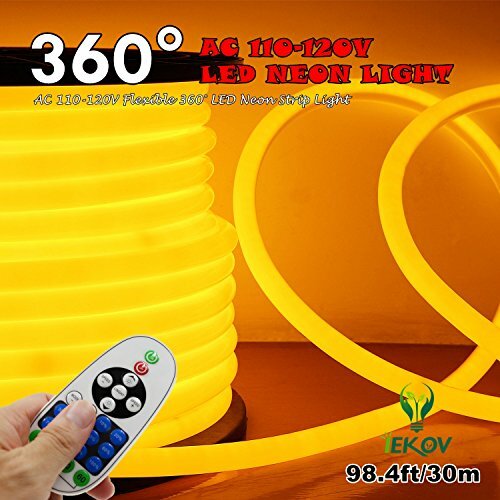 360° NEON LED LIGHT: Upgrade full vision 360 Degree Neon LED light, perfect lighting for Structure outline such as Roofs, Windows, Doors, Storefronts and Carports. Excellent for home and garden lighting decoration. EASY TO INSTALL: Dimmable by remote controller, Waterproof Neon light strip can use Indoor and Outdoor, Plug and Play without wiring, 110-120V AC Powered. LOW POWER CONSUMPTION: Super Bright LED light running with Low Temperature. All the light spread and completely smooth, luminous very even. FLEXIBLE AND CUTTABLE: Neon light strip can be shaped, formed or bent in any angle. It can be cut in every 1.64ft/0.5m without damaging the rest strips. ECO-FRIENDLY: No splash and UV, without mercury and no damage to human and environment. If you have any questions about this product by IEKOV, contact us by completing and submitting the form below. If you are looking for a specif part number, please include it with your message.